e-cloths really are different and give a fantastic chemical free clean with just water. If you take care of them they will last for years. e-cloths work so well that you will get a lint-free, smear-free clean with just water. Kitchen cleaning with a Kitchen Pack removes 99% of bacteria from your kitchen surfaces. e-cloths are made of millions of tiny fibers that pick up dirt which normal cloths just leave behind. When we say tiny, we mean each fiber is about 1/200th the width of a human hair. 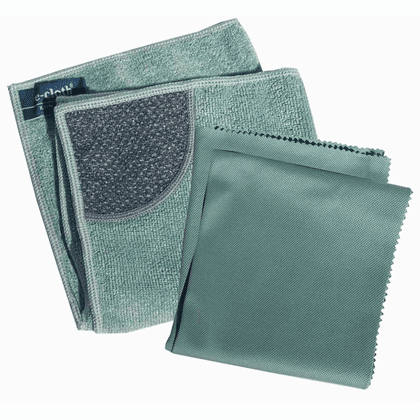 These tiny fibers attract moisture and oil, lifts and traps dirt, grease, grime and bacteria. Leaving your surface clean and polished with no chemical residue left behind. This process is healthier with no chemicals used. There is no chance for potentially harmful fumes and residue. This is important to children, as well as allergy and asthma sufferers.